On Sunday July 22, 2012 Sweet Molly Malone turned one year-old. Our friends Pinky and Ray Prosics who bred her, invited the puppies and owners to a first birthday party for the litter at their house. Seven of the puppies lived close enough to attend along with Molly's mother Maple, grandmother Sassy, big brother Riley and one other adult setter for a total of eleven red-heads present. Photographing the event was like trying to nail Jello to a tree. I shot mostly video and while editing it discovered there were some interesting motion captures within the video. The majority of the still photos shown here are screen captures from the video. Many of them are not as sharp as I would have liked but non-the-less depict the action of the day. Molly is wearing a blue neckerchief. 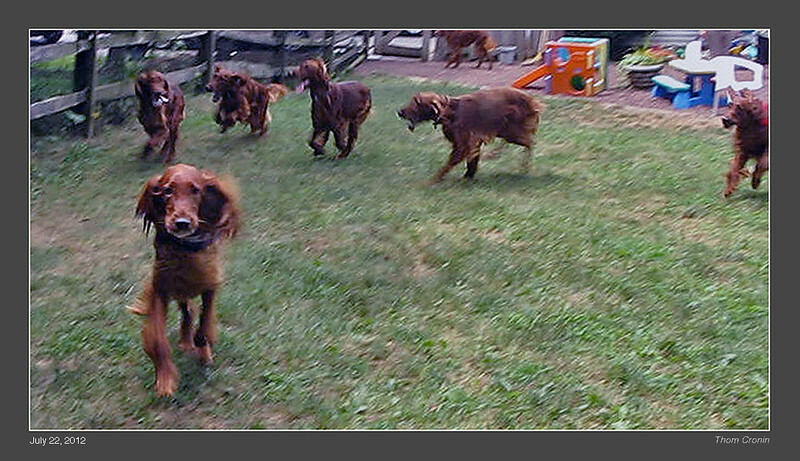 Molly uncharacteristically out in front of the pack.